Hello, everybody. Welcome to Lifesize Live!, the live web show produced entirely using the Lifesize platform. I'm your host, James Ofczarzak, and today we have Mike Granados from our award-winning partner, Perfect Video Conferencing. So welcome, Mike! It's good to see you again. Why don't we take just a moment and, Mike, can you introduce yourself and Perfect VC? Yeah, sure. Perfect Video Conferencing has been around for eight years. I was the first employee, and we're located in Emeryville, California. We're one of Lifesize's gold partners. We cover the greater Bay Area as far north as Sacramento all the way down to south San Jose, and we love the Lifesize product line. So you've been with us all along the way? Yeah, I've seen everything from the Icon 200 series, the first high-definition codecs that Lifesize was pushing out to the UVC platform, and now to this great Lifesize cloud-connected product. So I've seen the evolution of Lifesize over the last eight years. Awesome. Well, let’s dive into today's topic, which is essentially why are customers choosing Lifesize? Now, being a sales manager, this might be a softball for you, but why is it that customers are choosing Lifesize over our competitors? There are several reasons that Lifesize is popular with customers. First of all, you have great audio quality with it. Lifesize makes a great phone with the Phone HD. It has four directional microphones on it, and it covers up to a 30-feet radius so it fits every single conference room. It's also a SIP device, which we really like. Not only does it control your video calls, but you can also make phone calls off of it. To the end user, this is the only device on the conference room table, making it clean, making it easy. You have one device to do everything you need to do in the conference room. Can you speak to that a little bit more? Specifically to the HD phone and how our phone plays into the overall solution. It does all the controlling in the conference room. Also, with this, we bring up the HD mic cable on the back of the Lifesize codec for content sharing. And, with this device, you can switch from your presentation to a video call to adding several users into your meeting with a Lifesize phone. So you're able to control everything from this one device. Great! I think another thing you had mentioned was the idea of presentations. Of course, we all know that when you’re connecting over video, whether you're in the conference room or working remotely at home, presentations are a huge part of collaboration. Can you speak a little bit more to the Lifesize offering as far as presentation goes? Yeah, absolutely. The Lifesize platform makes it really easy to get guest users in. I send them a calendar invite via the Outlook plug-in, they receive it, they click on the link, and, if they're using a Chrome browser, they can join me directly right away. Lifesize makes a WebRTC client with no downloads, which makes it very simple for me to connect with my customers. When I get connected with them, I get an inbound call, accept the call, and I'm able to share content with them immediately. So I can just plug in my HDMI connection. It's plug-and-play, and it auto-scales, which increases the efficiency of our meetings. The customer is able to have a great experience, and we're able to show them a great product and the value of that product. Definitely. Mike, we'd be remiss if we talk a little bit about post-sales, right? We talked about hardware and software. What is it about Perfect VC and Lifesize that really sells on the post-sales side of things? What we like is that partnering with Lifesize provides our customers a three-tiered support system. So you get your value-added partner, which is us. We help integrate the product, choose the hardware, and support you on the front end. We're the first line of defense to support. Then, you also have Lifesize Direct, where you can reach out to the manufacturers. 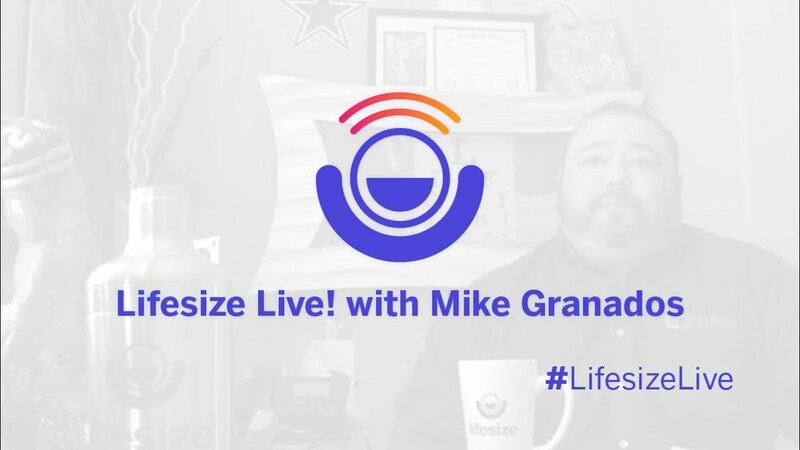 Customers can call Lifesize directly and get connected with somebody in the Austin headquarters immediately. And then you have the self-service side, which is the third and newest tier, on the community page on the website. There, you're able to ask your peers questions and talk to different people at Lifesize, and you're also able to find cheat sheets, data sheets, and information to self-service or troubleshoot any issues that you might have. Awesome. Well, Mike, I appreciate your time here today. It's been a great eight-and-a-half years working with you. We're very, very excited to continue on this journey together. So, thank you so much for your time, and thanks everybody watching on the live-stream. Please join us this coming Tuesday for our next installment of Lifesize Live! © 2019 Lifesize, Inc. All rights reserved. Information contained in this document is subject to change without notice. Lifesize and the Lifesize logo are registered trademarks of Lifesize, Inc. All other trademarks are the property of their respective owners. Contact one of our local sales representatives. Contact a local sales person. Final Step for Instant Access!